When it comes to shopping, I’m all about the deal. 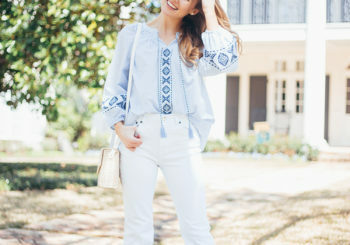 I’m a frequent Forever21, H&M and Target shopper, and find a little too much joy in scouting out low-priced boutiques all around in Dallas. (Video on one of my favorite spots is coming soon!) But you know how it goes… every once in a while, you come across a piece that doesn’t quite… fit in the budget, if you know what I mean. But you fall in love, and you can’t stop thinking about it, and you pull the trigger with the “treat yoself” mantra ringing in the back of your head. That, my friends, is the story of this dress. A little on the expensive side, but so incredibly good. If you only could have heard my reasoning for finally adding this gorgeous white maxi to my cart. I went so far as to tell myself that “One day when I get married I’ll wear it to one of my bridal showers!” New low, my friends, new low. But I hope you see why I just couldn’t say no. This dress is unlike the so many I see on a daily basis… the fabric has the most billowy, luxurious feel in the creamiest of whites. The tie-around waistline, the subtle side cuts, the elegant ruffled hemline along the shoulders and hem… all simply too much for me to resist. Now that it’s mine, I need your help in brainstorming destinations to wear this beauty so that I can fully justify it. They say it takes a village, right? Ready, set, go! What a gorgeous dress! Thanks for sharing! What’s the bust situation of this dress? Is it lined? Are there built in cups? This dress is absolutely AMAZING. Love the low back detail and ruffles! 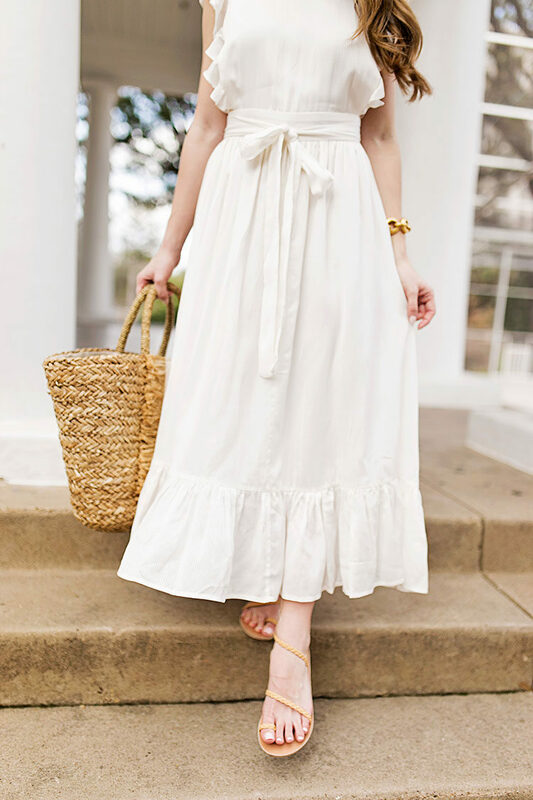 I purchased the white ruffle wrap maxi dress from Nordstrom you recently posted and girl, it is the best thing ever! This dress looks adorable on you! Loving white for the spring/summer! Check out my blog if you get a chance babe! Oh my goodness this is GORGEOUS!! As I clicked on the link I said ‘please be affordable’ Ah dang haha Definitely a splurge but looks so worth it! Is this dress reversible? Beautiful! This is a truly beautiful dress and I love the length! Did you have it altered? I think you need to travel somewhere tropical with this one!